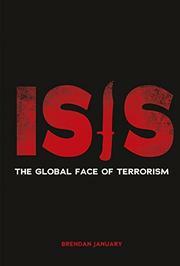 In this slim nonfiction volume, January traces the genesis, activities, and influence of the global terrorist group known as ISIS. This book draws readers in with a detailed description of the 2015 terrorist attacks in Paris, then moves back in time to the U.S. invasion of Iraq as a setting in which divisions deepened in the Middle East and extremist leaders found followers. Next, ISIS leaders move to war-torn Syria, recruiting desperate, vulnerable people and terrorizing local populations. The organization’s global recruitment scheme is presented as having dangerous appeal to young Western Muslims. The final chapter, “The Challenge of Our Times,” presents debates such as barring Muslim refugees from Europe and the United States and discusses “Security versus Freedom: Trade-Offs” in the same impartial voice that dominates the text. The text depicts the devastation ISIS causes in the lives of Muslims and non-Muslims, and it mentions mainstream Muslim scholars’ condemnation of extremism. It does not clarify the tremendous difference between ISIS’ “radical interpretation of Islam” and traditional ways of practicing Islam. In particular, the book does not challenge ISIS’ claims that they follow the example of the earliest Muslims. This omission leaves readers with the harmful (and false) impression that ISIS’ mission and practice represent the original form of Islam.